Cells were first described in 1665 by Robert Hooke, who designed one of the earliest Microscopes. He examined sections of cork that were composed of numerous box-like structures, which we now know as dead cells. As more materials were examined it became apparent that organisms are composed of Cells. This idea is embodied in the Cell Theory. All cells arise from pre-existing cells: Mitosis. Eukaryotes: One having true, membrane bound nucleus, includes all plants, animals, fungi and Protoctists. Prokaryotes: One lacking true Nucleus. Its genetic material is a circular DNA molecule, which isn't enclosed by any membrane. Region where it resides is said as Nucleoid. It includes Bacteria. Includes Ribosomes, ER, Golgi body, vacuole and centrioles. The spherical or ovoid Nucleus, whose diameter ranger from 10 micrometer to 20 micrometer, is perhaps the most prominent part of the cell that covers 10% of cell’s volume. There is a double membrane surrounding the nucleus, outer membrane is continuous with other organelle i.e. Endoplasmic Reticulum while the inner membrane is smooth. Nuclear envelope bears pores known as nuclear pores. Each pore is a channel through which molecules can move between the nucleus and cytoplasm. Most of the cell’s DNA is located in the nucleus and is organized along with proteins (Histone) into chromosomes. And the most visible structure within the non-dividing cell is Nucleolus, within the nucleus. ER originates from outer membrane of Nuclear envelope, consisting of network of membranous tubules and sacs called Cisternae. ER having ribosomes on its surface appears to be rough under electron microscope. ER without Ribosomes appears smooth. Rough Endoplasmic Reticulum is site for protein synthesis While Smooth Endoplasmic Reticulum synthesizes lipids. Ribosome is made up of Protein and rRNA in roughly equal quantities is a non-membranous organelle. It has a sedimentation coefficient of 80s and consists of two subunits 40s and 60s. The sedimentation coefficient of a particle depends on its molecular size and geometrical shape. Ribosomes may be found attached to the Endoplasmic Reticulum or may be found suspended in the cytosol. In both cases, the ribosomes usually occur in clusters. It is the major site of Protein synthesis. Cells active in protein synthesis have a large number of ribosomes. The Golgi body consists of flattened membrane-bound sacks also known as Cisternae and a system of associated vesicles called Golgi body. Cisternae are continually being formed at one end and continually being broken at the other end. 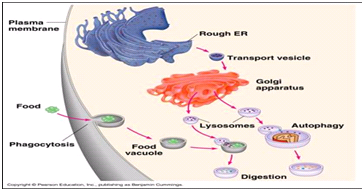 A vesicle that buds from the ER adds its membrane and contents of its lumen to the Golgi body by fusing with the ‘forming’ face of the Golgi body. Receives proteins and lipids from the ER and chemically modifies them. Sorts and package proteins and transport them to various cellular locations. Hence it is also known as “Post office” of the cell. Synthesis of new cell wall. 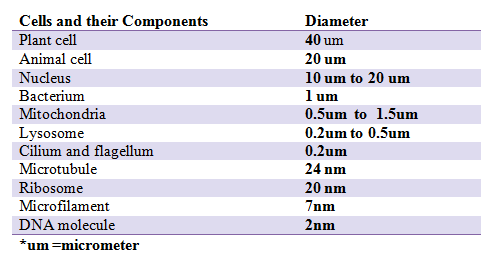 Small, spherical vesicles, ranging from 0.2 micrometer to 0.5 micrometer in diameter. They contain hydrolytic enzymes such as lipase, nuclease which is why it is having low optimum pH and are acidic; single membraned. Fuse with vesicles formed by endocytosis and hydrolyze material within. Autophagy: worn-out organelles are digested. 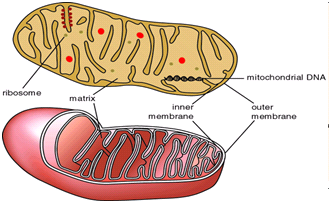 Either cylindrical or spherical, organelle ranging from 0.5 micrometer to 1.5 micrometer in width and 3 micrometer to 10 micrometer in length, which is bounded by a double membrane, is known as Mitochondria. Both membranes are separated by inner-membrane space. 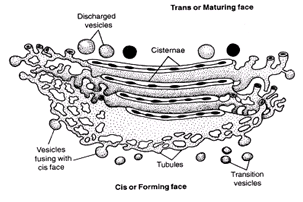 Outer membrane is continuous while inner membrane is extensively folded to form partitions called Cristae, which projects into semi-fluid matrix. "Mitochondria are considered to be independent of the control of nucleus because of the presence of circular DNA and 70S ribosomes. It was also suggested that mitochondria might also represent prokaryotic organisms that invaded eukaryotic cells at an early stage in history of life." It is a large organelle, typically a few micrometers in diameter and about 5 micrometer to 10 micrometer in length. It consists of two membranes; outer one is smooth and continuous while inner gives rise to membranes called Lamellae or Thylakoids, which extends throughout the interior. 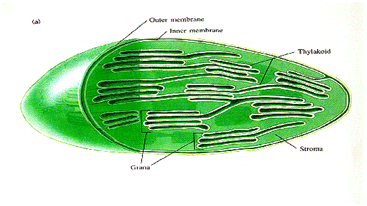 Chloroplast is filled with a gel-like matrix called stroma, in which thylakoids are staked to form grana. Stacks of grana are joined by intergranal lamella. Like mitochondria, chloroplast contains circular DNA molecule and 70S ribosomes. Fluid filled sack bounded by a single membrane. Vacuoles in animal cells are smaller and more numerous than in plant cells. Plants vacuole keeps it turgid. Pair of rod like structures positioned at right angle to each other and is situated next to the nucleus. It Plays a role in nuclear division. It is the outer most boundary of a plant cell, Fungi and Algae. 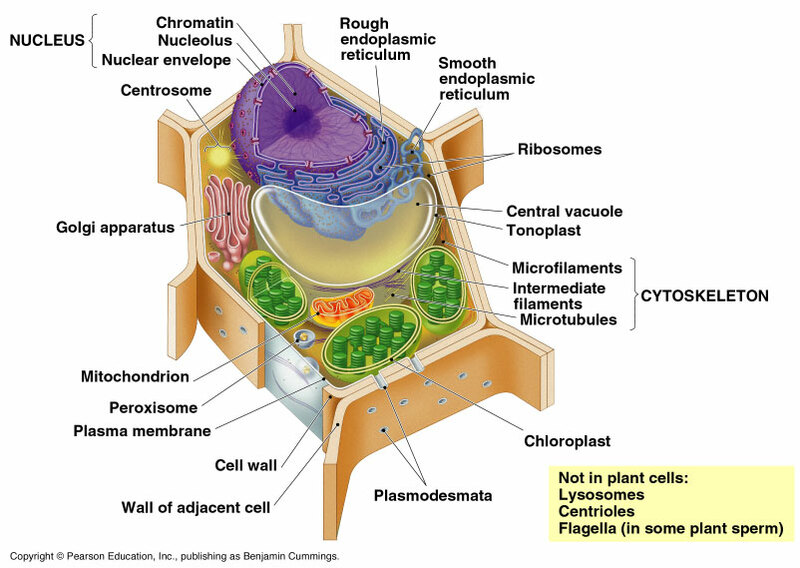 In plant cell and algae it is formed by cellulose while in fungi it is formed from chitin. It is laid down during cell division and starts as a thin layer of pectin which forms the middle lamella. The layer of cellulose secreted by outer part of cytoplasm constitutes the primary wall. In some plants after it reaches its maximum size another layer of cellulose is formed known as Secondary wall. Between the walls of adjacent cells pores are present by the name of Plasmodesmata and pit they are a kind of cytoplasmic strands linking cytoplasm of two neighboring cells. Cell membrane is the outer most boundary of an animal cell. It is self-repairable, delicate and elastic. Membrane is composed of phospholipids, proteins and carbohydrates arranged in fluid mosaic structure. Phospholipid is the main lipid found in this membrane forming bilayer with hydrophobic tails facing inwards and hydrophilic heads facing outwards. This consists of a phosphate group, a glycerol molecule and two fatty acid molecules. Integral/Intrinsic protein which penetrates only part of the way into or all the way through the bilayer. Cell membrane also contains carbohydrates bonded to proteins or lipids forming glycoproteins or glycolipids. Cholesterol is found between phospholipid molecules. Sense the external changes and response to them. Maintain structural relationship with neighboring cells. Enable separate compartments to be formed within the cell. Allow the attachment to the enzymes. The major interaction responsible for stabilizing plasma membrane is hydrophobic.Give its reason with explaination. when will cell membrane acts as selectively permeable and differentially permeable? is there any difference between selectively permeable and differentially permeable? present in that membrane. so it acts as selectively permiable. NO. Both terms are same.